Preheat oven to 325 degrees. Invert eight heat-proof 6-ounce ramekins over a baking sheet, and spray them lightly with cooking spray. Fold a 1-inch pleat in the center of each crepe and drape over a ramekin, then repeat with the other 7 crepes. Lightly spray the crepe cups with cooking spray. Using fingertips, gentle press the crepes to fit around the ramekins. Bake for 5 to 7 minutes, or until crepe cups are crisp and shapes are set. Carefully lift the Crepe cups from the molds and cool completely on wire racks. Using an electric mixer, mix together milk and pudding mix. Add cream cheese and blend again until smooth. Cover and chill cheesecake filling at least 15 minutes. To assemble dessert, place each crepe cup right-side up on a dessert plate. 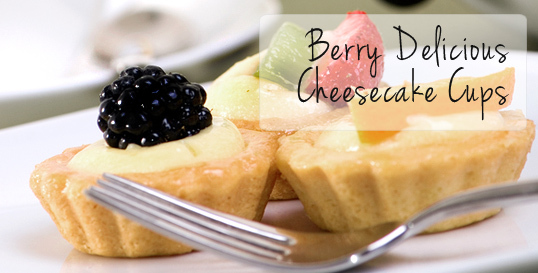 Layer in cheesecake filing, sliced berries, and repeat, ending with berries on top. Garnish with mint leaves.